Summer 2017: 5 Workshops, camping, BBQ and lots of fun at our Studio. The Workshops are covering following Topics: Moldmaking, Silicon casting, Resin casting, Sculpting, Armature Puppetfabrication, Animation and Lip Sync. All Workshops are in german language. We´re going to have another Animation-Camp with 5 Workshops, camping, BBQ and lots of fun at our Studio this summer. All Workshops are in germann language. The Dates and Workshop descriptions for Formenbau II (Moldmaking & Silicone) as well as Lip-Sync are final and online. Both workshops are now open for booking. We upgraded all workshopsystems from DragonStopMotion to Dragonframe for the Animation and Lipsync dates. The Summer Camp is Vegan- Vegetarian Friendly, we are vegetarians ourselves. If you are vegan just drop us a line with your registration email and we make sure that the catering won´t contain any non vegan incredients. For the BBQ we have a grill for the carnivores, and either a separate one for vegans / vegetarians. or the possibility to prepare something in a pan on the stove in the studio kitchen. We´re offering new Workshops this Summer with 2 new topics, participants will have the chance to bring a tent and camp close by the studio and again we´re going to have Breakfast & BBQ together. We motorized several new DSLR lenses. Here´s a quick focus test using a NIKKOR MICRO 55mm P.C. The shot was exposed "Moving Step" to create a real motionblur. Next on the to-do-list is to hook up some zoom lenses to the system which asks for some small changes on the Rig. We also added several Light Barrier Sensors to the Rig for exact repeatable AUTO-ZERO-ing and doubled the number of Dragonframe controlled DMX Channels for computer controlled Light dimming. Shel & Justin Rasch started a Kickstarter campaign to fund the postproduction of their DOGONAUT projects. The progress with CC3 is very slow, but there is progress. Back to the Roots: a few weeks ago we started to work on Crappy Christmas 3. We are looking forward to work with real Clay-Characters again and to combine our Oldschool Weirdough-Style with all the new possibilities our current equipment offers us. We created an Album with Making of images for all of you who want to follow the resurrection of our 1999 classic. The few images that are up so far already give an impression where we are coming from and where the project is heading. The Album will be updated as we go on. we created a page on Facebook so you can like and comment all News, Images and Videos The Site is still lacking some content but will be filled within the next week. It´s a public page so you can access all content wether you´re on FB or not. We think about starting a blog as well. looking forward to read from you ! 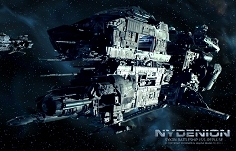 In France Nydenion runs under the title "STAR CRUISER"
This trailer contains several so far unpublished scenes including Miniature Moco shots we created. Daniela is a Motion Design Student at DHBW Ravensburg and shot her first Stop-Motion Projekt in our Studio in January. The Result is now online. Metamorphose is Danielas first approach to Stop-Motion. Kathrin Burget creates Muppets, Handpuppets, Walkacts, and lots of other Puppet and Costume pieces. Shortfilmfestival in Oldenburg, Germany from November 22. to 25. Submissions are open til August 15. Our ASP "ME" Video reached over 1,3 Million Clicks on youtube. As a little Special we published the original Line Test Material from some selected scenes. This new action packed Trailer is used for the Japan release of Nydenion and is features lots of great new scenes incl. several Motion Control shots we produced. 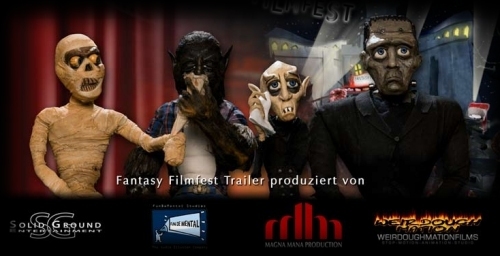 The 25th Fantasy Filmfest already started it´s tour thru 7 major cities in germany. On board: the new trailer that we actually shot last year but was put on hold. The trailer features a new female Character which was sculpted and casted (full body silicone cast) by Susanna Jerger. 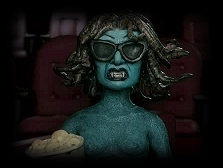 Since the Spot was planned for 2010 we picked MEDUSA as a tribute to Stop-Motion Legend Ray Harryhausen who celebrated his 90th Birthday last year. AND EVEN MORE AWARDS FOR MINIMALISM ! NYDENION TRAILER 2010 ONLINE ! Fresh from the renderfarm: brandnew Trailer for Nydenion - a Science Fiction Feature Film - made in Germany ! All Motion Control Miniature Modelshots for the production of nydenion where shot here at weirdoughmationfilms. After the original ASP Horror Vacuii Special Edition bhas been sold out for quite some time here´s a new chance for everybody who wants to own a DVD copy of the clip. The ASP "ME" Video as well as the making of are part of the DVD shortfilm compilation"Fantasy Filmfest Shorts"
MINIMALISM was awarded with Gold in Category 24 Streaming/Web-Only Films/Web-TV and with Gold in Category 41 Best Animation, Graphics and Special Effects ! On top of all Minimalism won the Autovision GRAND PRIX ! AutoVision is the international festival for films, commercials, websites, and interactive productions in the automotive industry. The ceremony was held during the International Motorshow (IAA) in Frankfurt. The Trailer - 2D & stereoskopische 3D version - is now online. Stop-Motion-Animation - animating 3D characters. 10 Years ago we bought a AMD K6 400Mhz system, a FAST AV Master Video-capture-card and grabbed a old Canon Hi8 camcorder to start our first stop-motion tests directly followed by our first (and never really finished) flick RABIES. See how it all began in 1999 ! FANTASY FILMFEST MONSTER TRAILER 2009 IN 3D STEREO ! Weirdoughmationfilms just finished shooting the Stop-Motion-Footage for the Trailer. It was shot in stereoskopic 3D using a custom sliding rig (incl. convergence). which was mounted on our Flair controlled Motion-control-system. The footage is currently in Postproduction @ Magnamana Production and should be released withing the next 2 - 3 weeks ! "an arabic mendicant explores his deepest desires because of a wonderful melody of a flute"
Weirdoughmationfilms produced the stop-motion-footage and handled all motion control shots for this project. Weirdoughmationfilms is working on a new Trailer for this years Fantasy Filmfest. And....it might become something really special....stay tuned ! get a taste of what is waiting for you here: Making Of Trailer"
Weirdoughmationfilms now works with Mark Roberts Motion Control Software "FLAIR"
ASP "ME" was voted best Music video at the readerschoice awards from ORKUS-MAGAZINE ! ASP "ME" is running in the international competition at short cuts cologne 2008 and will be screened on December 6th, 16:00 CET (int. competition BLOCK7) Filmhaus Kino Köln. ASP "ME" was nominated for the MKN-AWARD 2008. The Winners will be announced at the awards ceremony on November 20th in Mainz. now online: 7 minute making of ASP "ME"
The 22nd Fantasy Filmfest opens tomorrow night in Berlin and wanders then thru 7 additional cities in Germany. Weirdoughmationfilms is currently working on 3 bumpers for this years Fantasy Filmfest. The production of the clips featuring all 20 Monsters from last years trailer is another cooperation between Magna Mana Production, Solid Ground Entertainment and Weirdoughmationfilms. The current Issue of Digital Production includes a 6 page Making-Of Article covering the production of ASP "ME". you can now find a T-Shirt and a Girlie-shirt with images of the puppets from the ASP "ME" Clip at the official ASP online-shop. Besides this there´s a official Filmposter as well as the first issue of ASP-Magazine "Papilion" with a making of ASP-Me article incl. an Interview with Director Thomas Klieber and Editor Jack Moik. ASP "ME" will be screened as a supporting film for DOOMSDAY at the Fantasy Filmfest nights 2008. For the screening the Clip was transfered to 35mm incl. new Dolby 5.1 sound. Check out the first finished scenes from our current production which are featured in a short Trailer to promote ASPs upcoming release "horror Vacui"
english versions can be found under the links to youtube and myspace ! Solid Ground Entertainment and directed by Thomas Klieber. IN PRODUCTION: ASP VIDEOCLIP "ME"
EVOLUTION SCREENING IN LONDON -> tomorrow !! This info comes a little late but we´re still waiting for a confirmation of the event. (Seems like) A compilation of several Episodes from our underground series Evolution will be shown as part of a "best of" program from the 2006 "Geld spielt keine Rolle" Short Film Festival. ROACH WINS MKN AWARD 2006 IN ANIMATION CATEGORY !